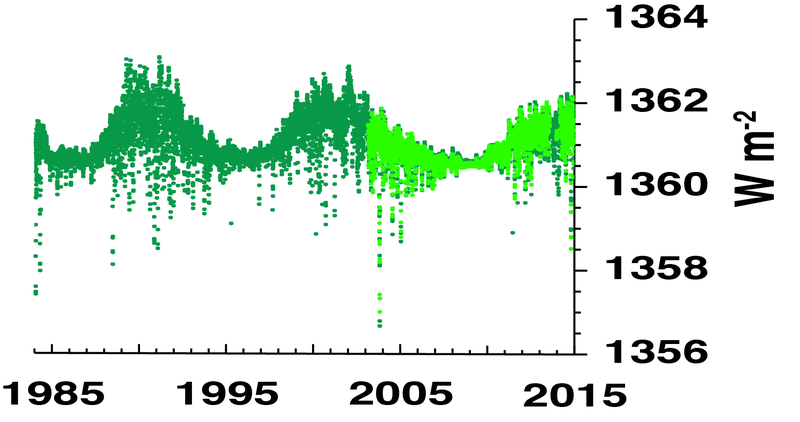 30 years of the 133+ year record of daily-averaged Total Solar Irradiance (TSI) produced for this Climate Data Record (CDR) (dark green) and its comparison to contemporary TSI measurements by the NASA SORCE mission. This Climate Data Record (CDR) contains total solar irradiance (TSI) as a function of time created with the Naval Research Laboratory model for spectral and total irradiance (version 2). Total solar irradiance is the total, spectrally integrated energy input to the top of the Earth's atmosphere, at a standard distance of one Astronomical Unit from the Sun. Its units are W per m2. The dataset was created by Judith Lean (Space Science Division, Naval Research Laboratory), Odele Coddington and Peter Pilewskie (Laboratory for Atmospheric and Space Science, University of Colorado). The daily- and monthly-averaged TSI data range from 1882 to the present, and annual-averaged TSI data begin in 1610. The data file format is netCDF-4 following CF metadata conventions. The dataset is accompanied by algorithm documentation, data flow diagram and source code for the NOAA CDR Program. Cite as: Odele Coddington, Judith L. Lean, Doug Lindholm, Peter Pilewskie, Martin Snow, and NOAA CDR Program (2015): NOAA Climate Data Record (CDR) of Total Solar Irradiance (TSI), NRLTSI Version 2. [indicate subset used]. NOAA National Centers for Environmental Information. doi:10.7289/V55B00C1 [access date]. Direct download for dataset files. Purpose The purpose of this Climate Data Record is to provide a continuous and long-term record of total solar irradiance (TSI) for scientists and modelers in the solar, atmospheric and chemistry sciences as well as the energy industry. For a complete description of use limiataions for this CDR, see the Algorithm Theoretical Basis Document.